When we planned our trip to Portugal, it was strongly recommended that we visit the Azores. These 9 islands are located in the North Atlantic Ocean about 900 miles (1.450 km) offshore of Lisbon, Portugal. 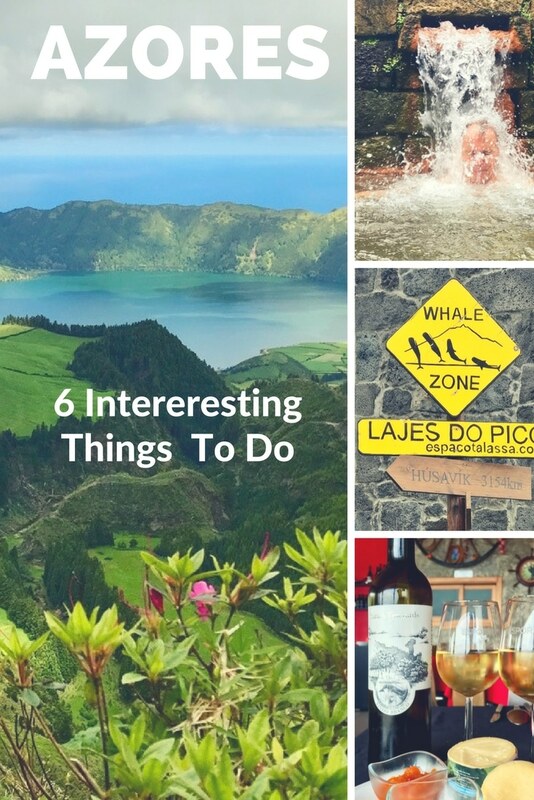 When we visited, we found so many interesting things to do in the Azores. And if you visit once, you will want to return! The Azores are volcanic islands with green space everywhere. We visited the viewpoints high above Sete Cidades on Sao Miguel Island. There were hiking paths all along the rim overlooking the volcanic lakes. Volcanic craters were always a great place to find the hiking spots. The day we visited the Faial Caldera, the fog moved in very quickly. It hid the hiking paths that ran across the top and down into the volcanic valley. There are some limits on hiking in this caldera, so you will want to plan in advance. 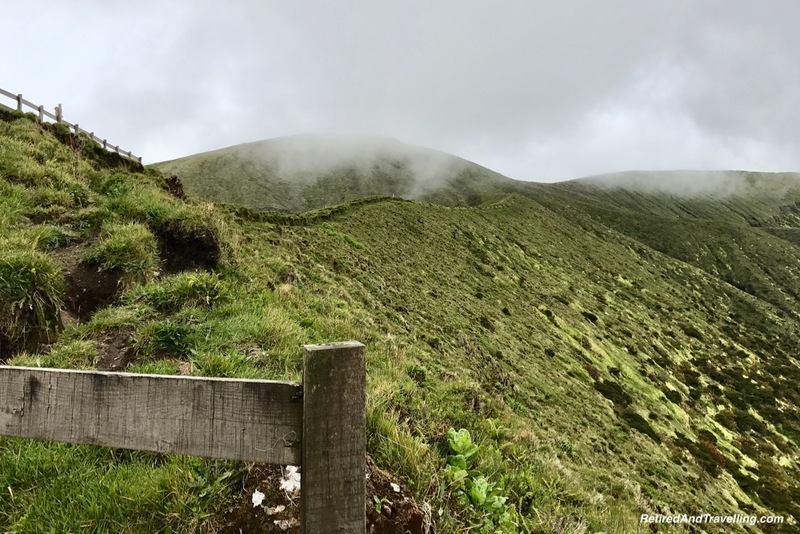 If you like to get out in nature, you will find hiking one of the simplest things to do in the Azores. It was very easy to drive around the Azores. The road systems were good and generally well signed. Having a car will let you plan your day around the weather. We visited the Azores in May. At that time of year, people commented that you might see all four seasons in a day. If you have escaped the city, you probably hoped you left the traffic jams behind. 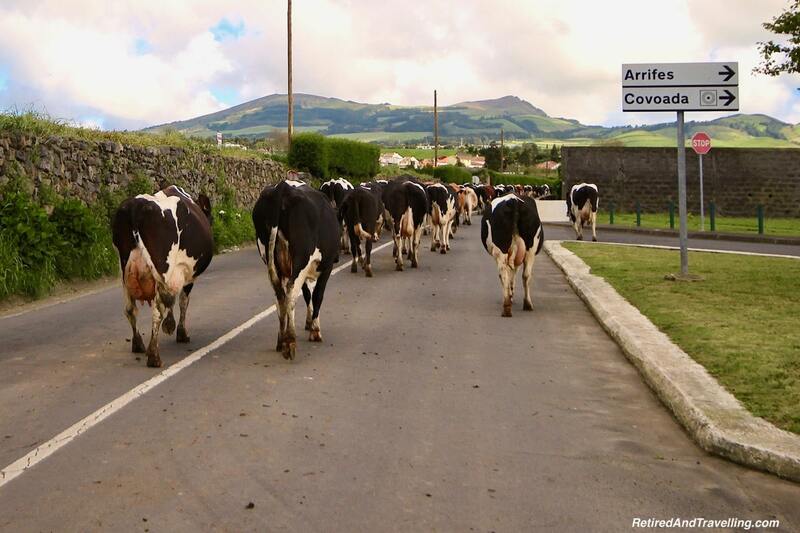 But our favourite kind of traffic when we drove around the Azores was a cow traffic jam. 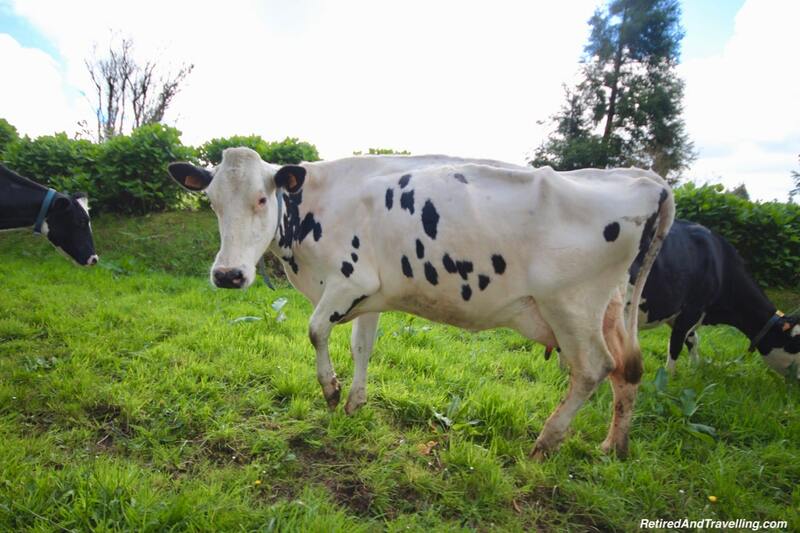 Many of the islands of the Azores have more cows than people! The cows were regularly moved from field to field. And we just watched the show. Much of the time, we were not sure who was watching who. The upside of so many cows however was some of the best cheese ever. You can find the cheese in the local stores. But not all of it is exported, so make sure to take home your favourite kind. 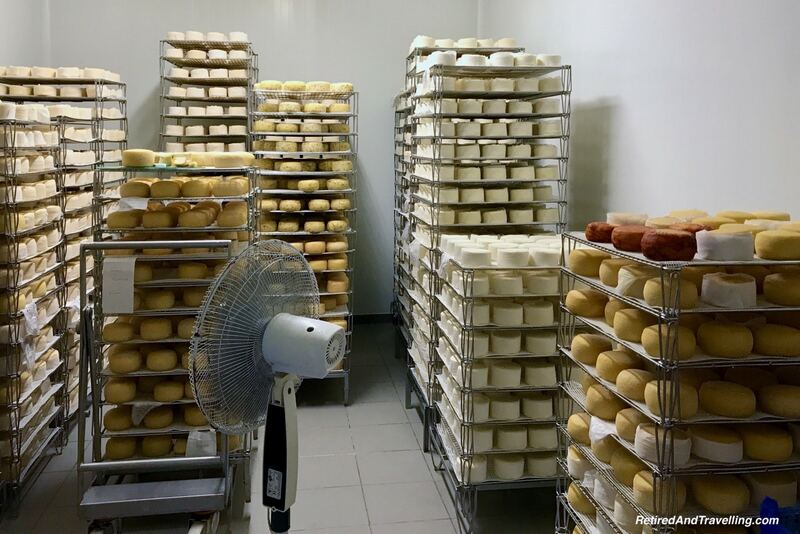 If you really want to stock up, there is a great cheese factory you can visit on Faial Island. 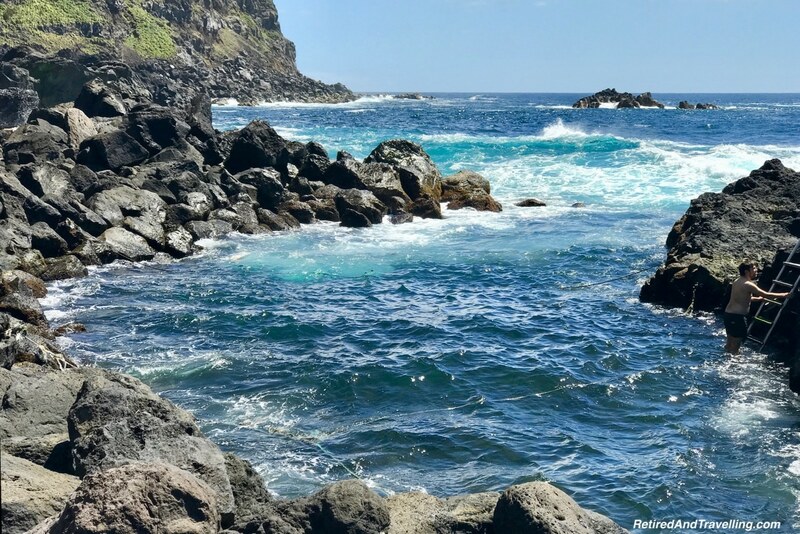 Taking it easy is one of the things to do in the Azores! The slower pace of life will calm you as the natural beauty excites you. The Azores are one of the spots in Portugal that produces wine. 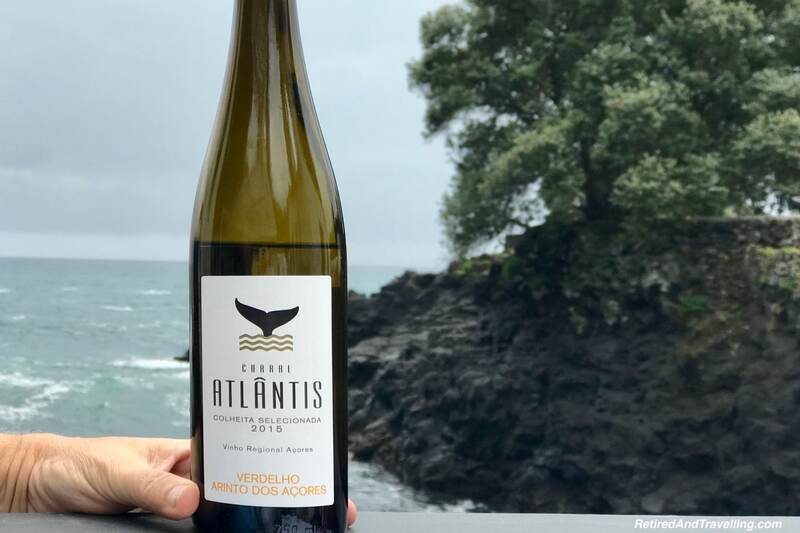 It has become so well recognized that it was sometimes hard to find local wine when we visited the Azores! But we managed to sample a wide range of Azores wines. When we visited Pico Island, we even got to see the vineyards. With the resurgence of the wine industry on the island, large fields are being reclaimed. The vineyards have a very typical design, with small rock walls separating plants. It reminded us very much of the vineyards on Lanzarote in the Canary Islands. 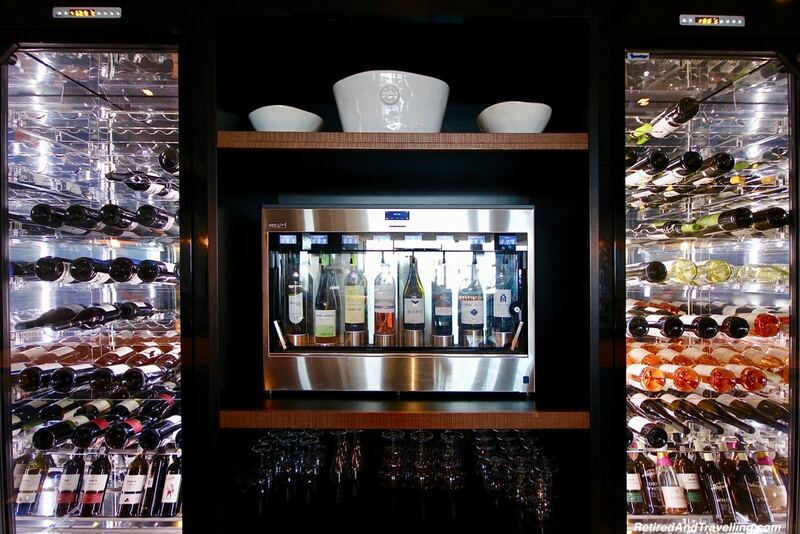 And if you want the ultimate in wine convenience, we found a hotel that had a wine dispenser in the lobby. Just put in your hotel room key. Pick the wine and glass size. And you are set to go. 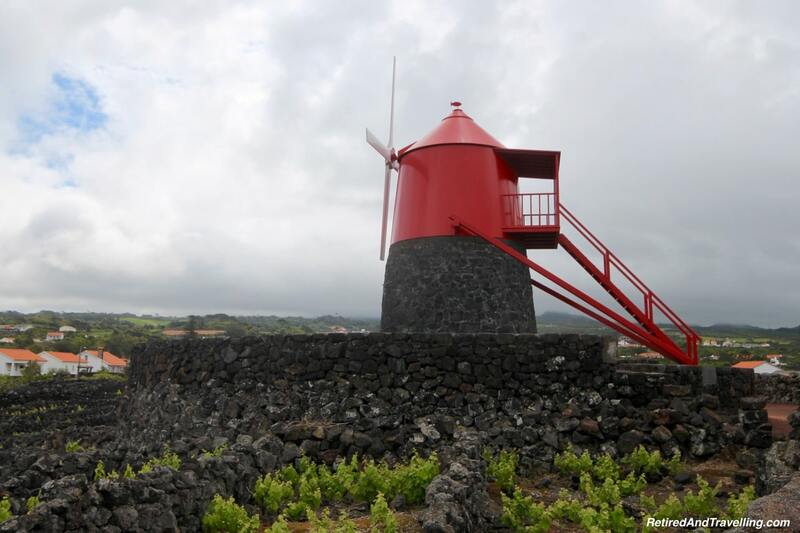 Exploring the developing wine industry is one of the things to do in the Azores. If you find a favourite wine, you should take it with you. Or plan a return visit to find even more! We found several interesting dining venues when we visited the Azores. 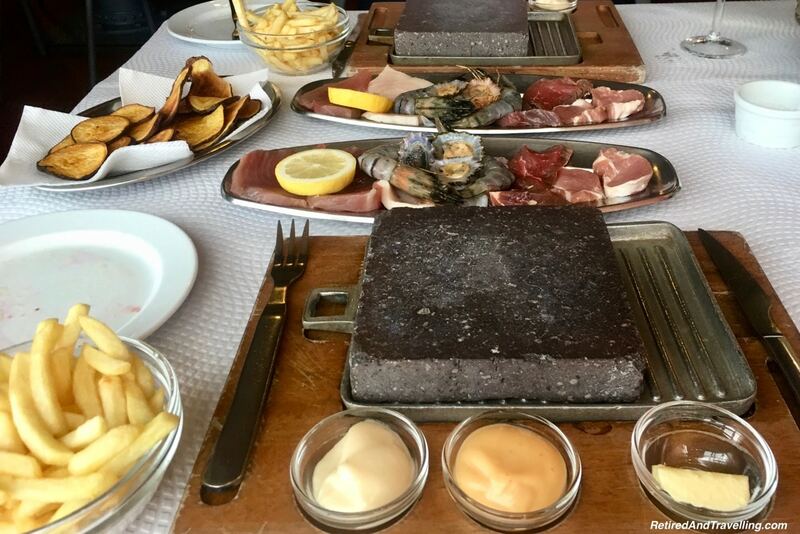 On Faial Island, we had a delicious feast that we cooked ourselves on a hot volcanic stone. There was a wide variety of things offered. And we cooked our feast just the way we liked it. 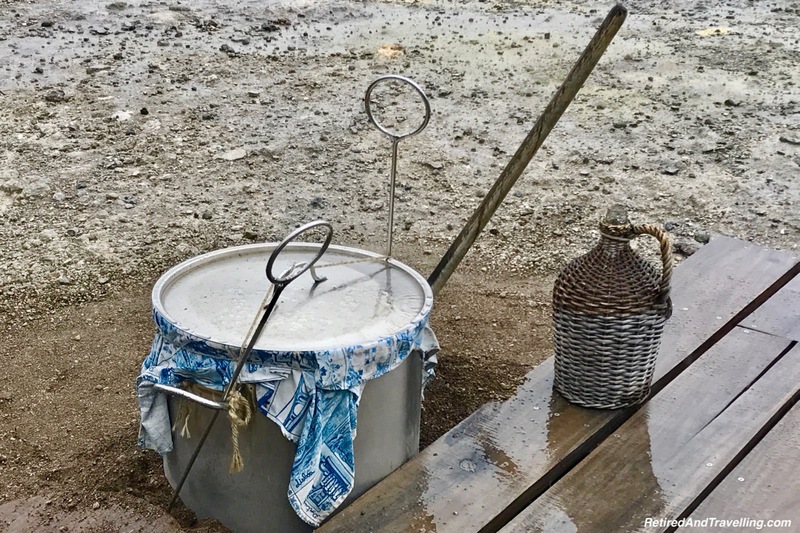 When we visited the calderas on Sao Miguel Island, we got to see the delicious cozido (caldera stew) cooking in the field. The large pots are filled with meat and vegetables. The pots are buried in the earth above volcanic steam ports. The stew cooks for 4 hours. We were at the caldera field as they came out and we got to order our pot for lunch. A short trip into town and we sat down to the most tasty lunch. Enjoying great food is just one of the things to do in the Azores. The abundance of cows meant that local cheese and meat was delicious. Being islands, the seafood was fresh and plentiful. The Azores are volcanic islands. Everywhere we drove, we saw the stunning volcanic sea coasts. We saw signs of the erupted volcanoes in the magnificent caldera lakes on the islands. 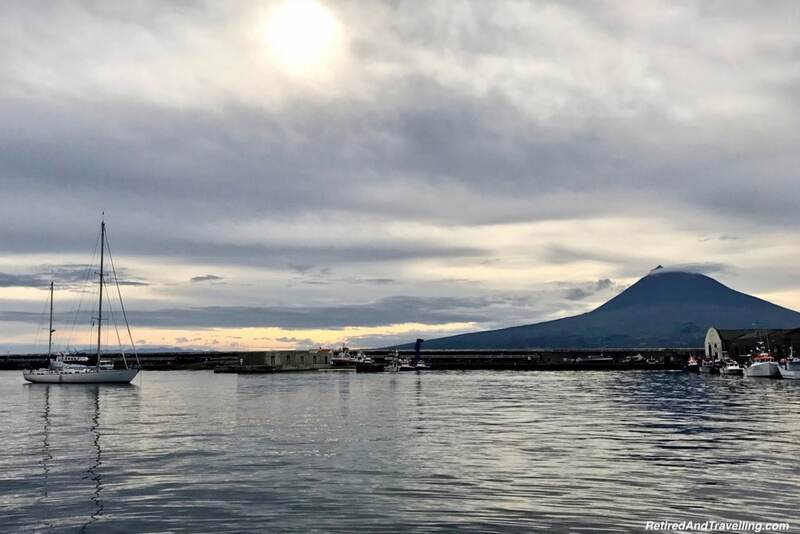 When in Faial, we had a constant view of Pico Mountain that has yet to erupt. On Faial, we also got to see the massive calderas at Capelinhos created in 1957. 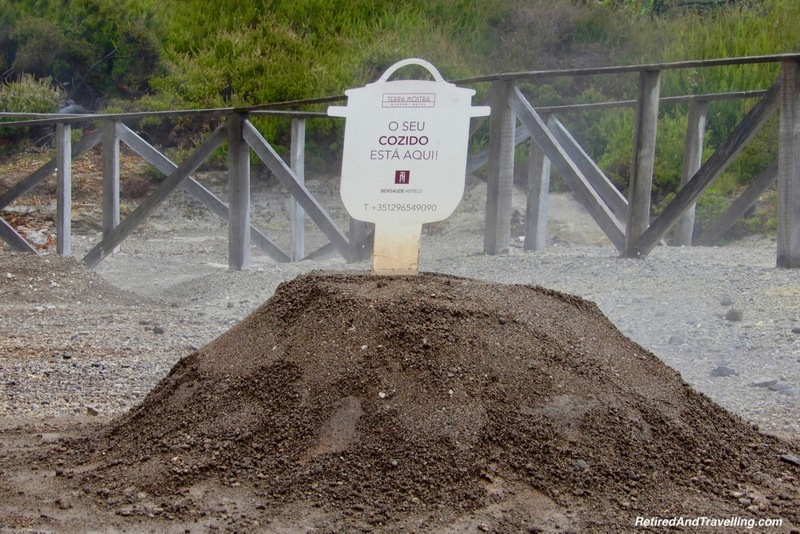 An underground museum provided a great education on the volcanic history of the Azores. While most of the hot springs we visited were just great to look at, we did find some that were meant for a dip. There were different pools at different temperatures. Even when the weather was cool, the hot springs were a great spot to relax. 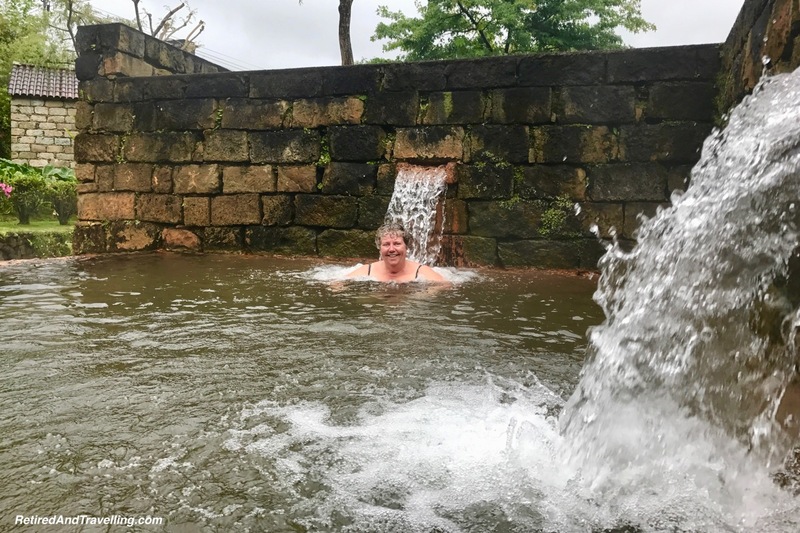 The wildest hot spring we found was at the Ferraria. The hot spring vented into the sea in a small cove. When the tide was down, this was a picture perfect spot to enjoy that mix of hot and cold water. But at high tide, it was a crazy swim. 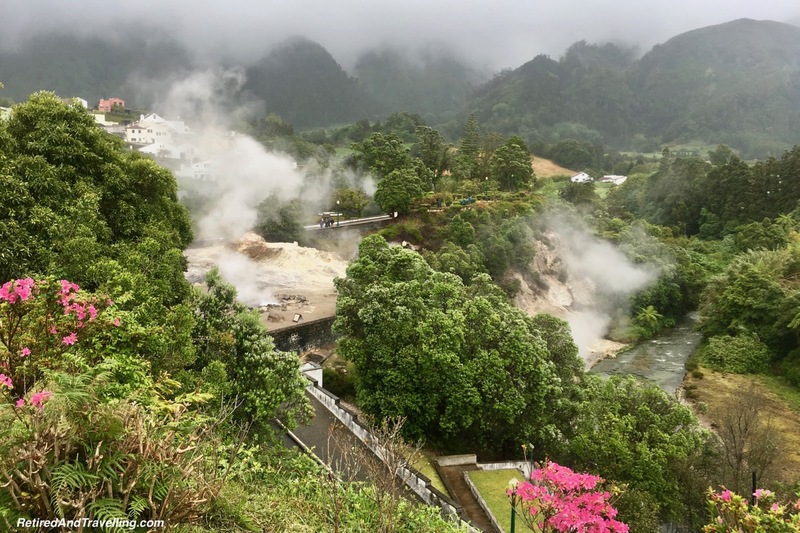 A visit to the hot springs is definitely one of the things to do in the Azores. The hot springs are idyllically located in green spaces. You will find a spot that is just the right temperature for you! 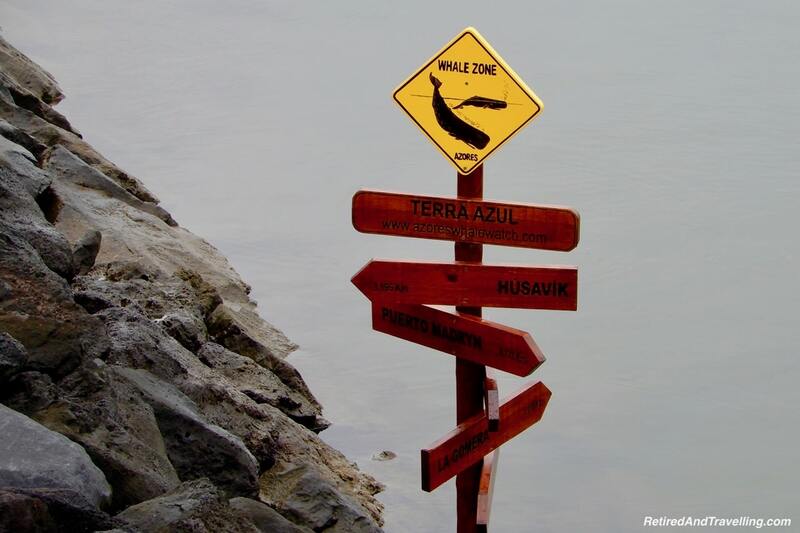 If the Azores are known for volcanos, they are equally known for whaling history. 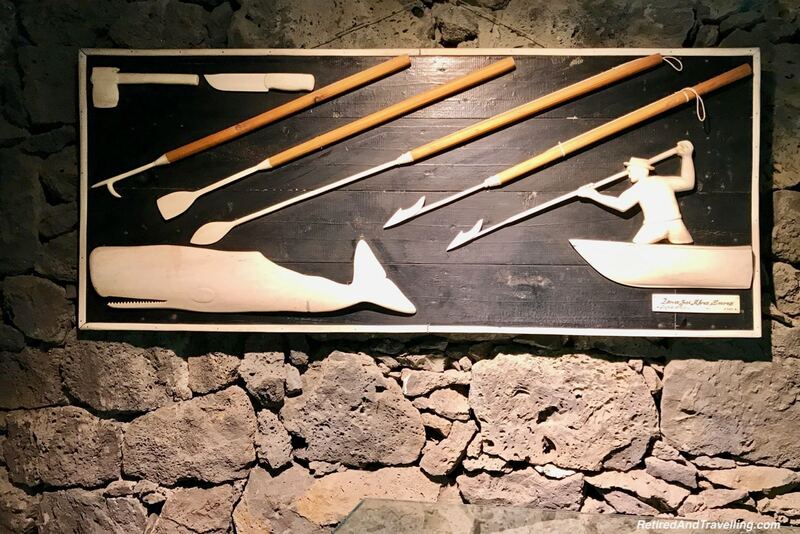 When we visited Pico Island, we enjoyed a tour through the whaling museum. Whaling was a major source of income for the islands until the practice was stopped. But the whales didn’t go away! There is great whale watching from both Sao Miguel and Pico Islands. The day we went whale watching, we saw both fin and humpback whales. The dolphins danced on the waves. And we got a great water view of the island. 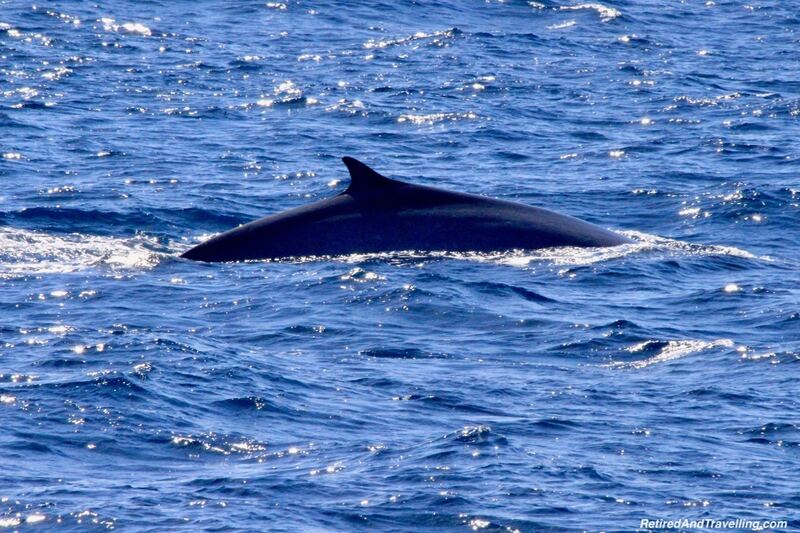 If you are like us, then whale watching is a top one of the things to do in the Azores. We keep heading out to the sea in search of that perfect whale breach. 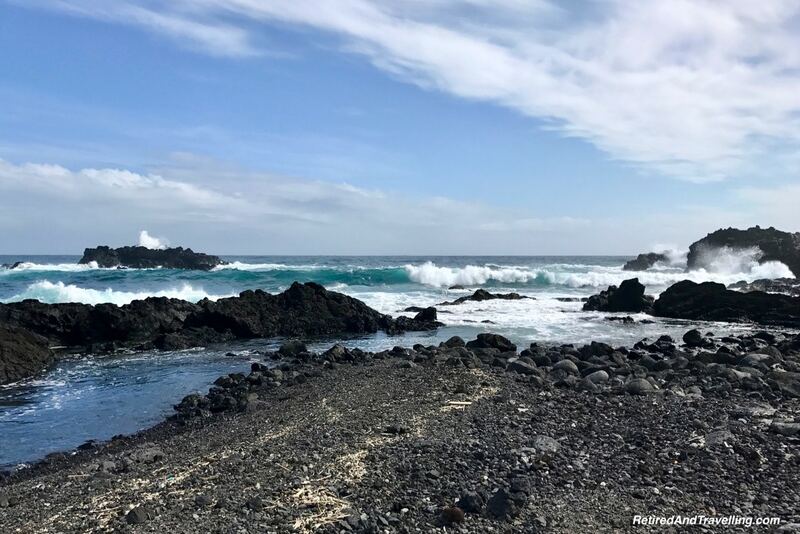 If you read our detailed posts about our visit to the Azores, you will see that we really loved these islands. 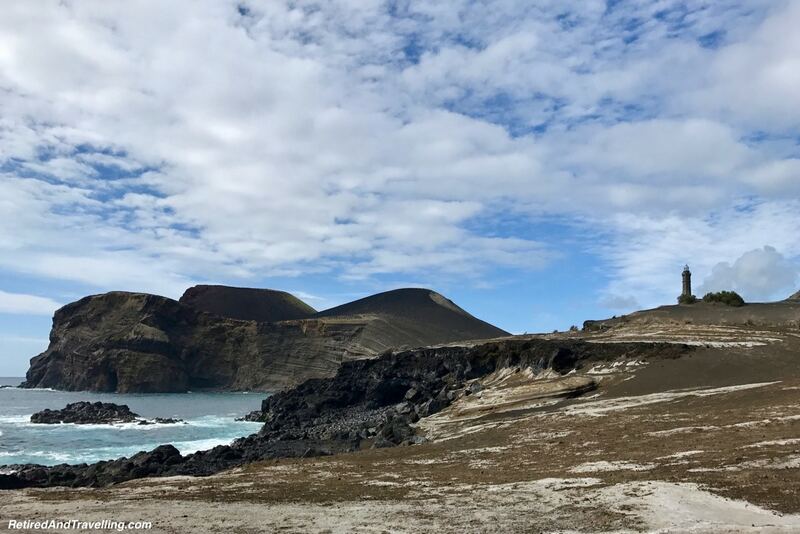 We revelled in the chance to enjoy the rugged volcanic landscape we found. Nature surrounded us everywhere we went. It was an ideal spot for us to enjoy great local food and wine. There was just so many things to do in the Azores. We found it easy to visit three different islands. We flew into Sao Miguel from Lisbon on a larger plane. The hop to Faial Island was done with the local smaller airlines that services the islands. Our trip to Pico was by ferry. The other islands in the group are equally as easy to visit. We heard so much great things about the other islands that we will definitely plan a return trip! What would be your favourite of the things do do in the Azores? I’d love to be stuck in a traffic jam too, if the one causing it are as cool as those cows! 😀 What a lovely list of things to do overall.. Indeed, Azores has an amazing selection of activities that people will love to see and experience.. Personally, the hike to the hills sound pretty cool. Is the trail hard? 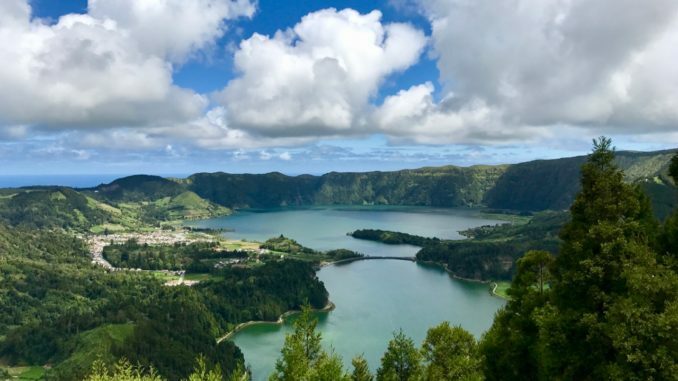 We see a lot of great travel deals advertised about the Azores in Canada (because we are always looking for a way to escape winter!) It’s so nice to have this list on hand to inspire our next winter escape! I’ll have to share this post with my husband, because I’ve been trying to convince him this is another place we need to go. 🙂 The wine, cheese, and hot springs might sell him on it. For me it’s all about the hiking and views. I’d love to do some hiking around the craters! Cheese, Wine, hot springs and Volcanoes. What else can one ask for? Going to Portugal and to Azores is on my list. Count me in for Whale watching or Dolphin watching any time. I love these huge but graceful creatures. Oh my goodness, this is really beautiful! The hills look like they have been sculpted to perfection! What a view! Watching dinner cooked seems such a tempting activity. I am sure to do that. 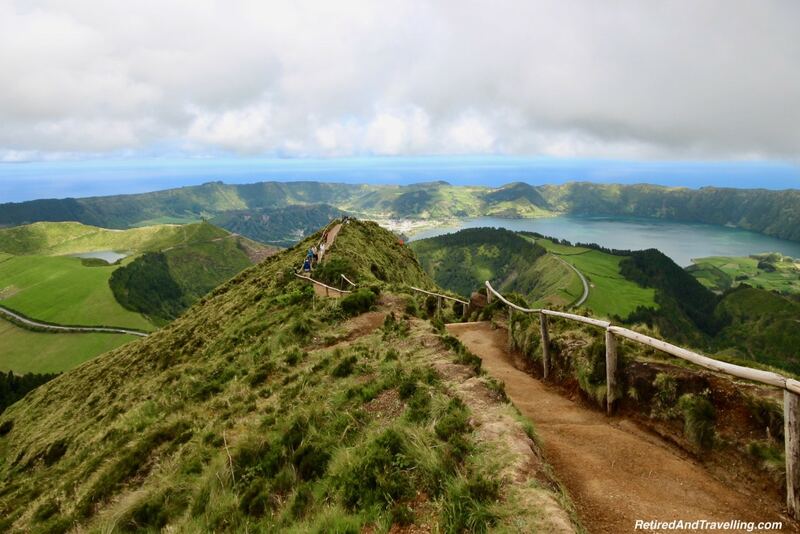 The Azores sounds like a treasure trove of sights and experiences. Love the natural landscapes. Loved reading about the “traffic jams” and smiled at the cow jams! The hot springs are something else that had me riveted. They look so inviting, though I guess not all of them are swim-worthy. Wow so many amazing things to do in the Azores. I’d love to taste that Caldera stew – how cool is that being cooked over volcanic steam!!! Fabulous! I’d love to hike with the kids along the volcanic rim too! Azores sounds so charming. With its natural surroundings and the natural “traffic jams”. I love the various trails that the place seems to promise. I would definitely enjoy the wine and cheese break too. Add to that the pleasure of Whale Watching. Guess I should definitely plan this side of the world! This reminds me of Hawaii with the black sands and hot springs, I would love to try the local wines and cheese – this all sounds wonderful for me. Just found your blog and I am really enjoying hearing about your travels. Have you been to Madeira?